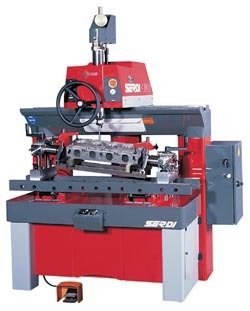 The Brand New SERDI 100 HD as a combination of a workhead on double air cushion, equipped with an upgraded high-torque spindle, which is operated by a 2.2kw motor, and a highly rigid bed that can carry very heavy cylinder heads with an easy travel front to back on air cushion table and pneumatic clamping. This new model is 216 percent more powerful than the previous serdi 100 heavy duty. For automotive and all diesel engines. Recommended for guide diameter bigger than .275" / 7mm.